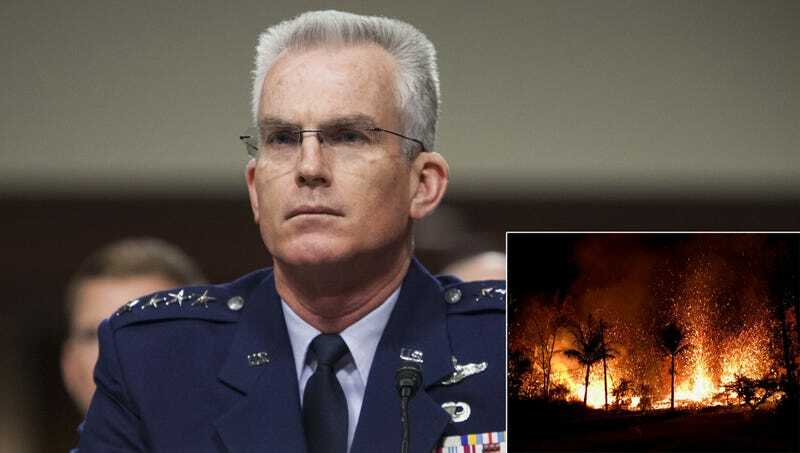 WASHINGTON—Explaining the strategy behind the recent domestic deployment of their new geological weapon, U.S. military officials released a statement Friday defending their much-criticized decision to test the Kilauea volcano on Hawaiian civilians. “The defense of our nation is paramount, and as recently as last month, we lacked a comprehensive practical understanding of the costs, side effects, and ultimate strategic advantages of deploying the Kilauea volcano in a real-world environment,” said U.S. Air Force General and Vice Chairman of the Joint Chiefs of Staff Paul Selva, who declared the launch of the top-secret, $65 billion military project as an unequivocal success. “We anticipated that the residents of Hawaii would be frustrated with the number of homes destroyed by lava and the amount of volcanic ash particles in the air, but those who would denounce this vital military initiative need to remember that Hawaii is actually sparsely populated and far more isolated relative to other potential test areas. From a military perspective, Project Kilauea Eruption is now ready for frontline use in future conflicts, so in the long run, volcanic tests on American citizens are part of our very real commitment to protecting American lives.” Pentagon sources disclosed that the Kilauea project was fast-tracked after recent seismic activity in North Korea suggested that they were developing several volcanoes of their own.